It's Friday! Whoo! 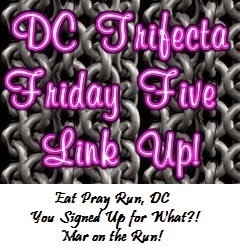 Like every Friday, I am linking up with the DC Trifecta: Courtney at Eat Pray Run DC, Cynthia at You Signed up for What?, and Mar at Mar on the Run, as I do every Friday. 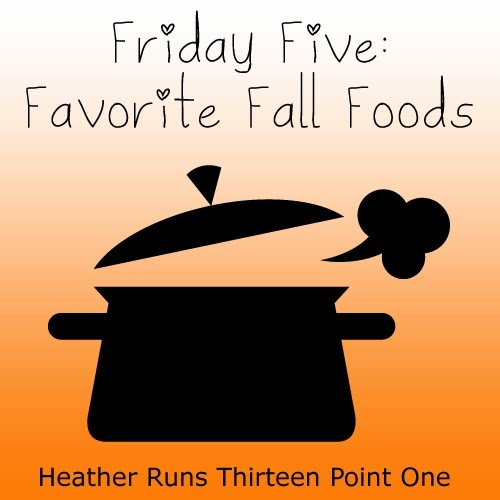 This week's theme is "Favorite Fall Foods". 1. Caprese Farro Salad. 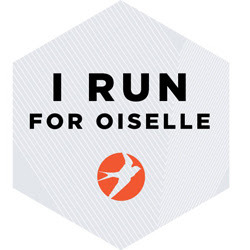 This recipe comes courtesy of the Runner's World Cookbook. Here's the recipe online. We have always used quinoa instead of farro. 2. Panera Bread Tomato Soup and Mozzarella Tomato Panini. I like to go over on my lunch break and pick up this combo. Helps keep me warm in our freezing office, and it tastes delicious. 3. Cinnamon Rolls. YUM. The smell is great to wake up to, plus when it's fresh from the oven it's just so lovely. It's a great weekend treat, when you have the time to savor it with a glass of milk and some tea. What are some of your favorite fall foods? Thanks to Courtney, Cynthia, and Mar for hosting! Make sure to check out their "Friday Five" posts (direct links above in first paragraph) and link up if you are joining in on the fun. 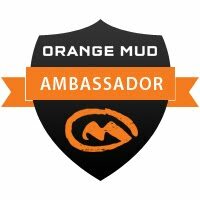 Don't forget to read/comment on some of the other link ups! You know, it's been a while since I've made overnight cinnamon rolls. I alternate between Alton Brown and Paula Deen's recipes, and they're so good (and pretty easy). Maybe I'll have to prep a batch for Sunday morning! I hear you on soup. I feel like all I want right now are hot and/or spicy foods. Winter is definitely edging in. YUM. I'll need to find an easy recipe for myself so I can enjoy some soon, too. I'll look into the ones you mentioned (though pretty easy might not be easy enough haha). All I want are foods that are heated now that it's colder out. Hello November (and soon December). Oh cinnamon rolls sound good!! It's been a while since I've had some. Love pumpkin and apple pie! That salad sounds really good! I may have to add it to tonight's dinner menu, along with adding cinnamon rolls to what I eat for breakfast tomorrow! We eat a lot of soup here too! It's perfect for chilly days! oh man, cinnamon rolls!!!! I haven't had one of those in a looooong time! number 2 was my exact lunch a couple of weeks ago. so yummy and so great on a cold day! It really hits the spot on those cold days! Great list. I love paninis. Well, even just hot sandwiches in general. Just gives it a little extra when its warm and melty like that. Wow. A homemade cinnamon roll sounds heavenly! My RW cookbook has been collecting dust, the caprese salad looks great! It's delicious! I need to start working my way through some more recipes.